AHD’s hospitals have a contract with Social Security which is a public insurance provided to Ecuador’s workforce including farmers. Social Security patients compose about 85% of Hospital PVM’s total patients and about 10% of Hesburgh Hospital’s. Physicians working at Ministry of Health facilities receive residency training at Hesburgh Hospital so they can become health care leaders in their own public hospitals in other parts of rural Ecuador. AHD conducts its family practice residency program with this university partner. This is the local tribe of Santo Domingo (2,500 people) who have maintained significant isolation from western culture for hundreds of years, but are now confronted with issues of language, deforestation and environmental contamination, a rapidly evolving western diet, educational challenges, and of course new health considerations. Hesburgh Hospital has conducted research on this group to help address illnesses of modernization that challenge the limits of their traditional medical model, which is managed by healers. This generous foundation in Owings Mills, MD has funded Hospital PVM’s operating deficit to bring that facility to financial self-sustainability. The foundation also gave a major injection of funds to build Hesburgh Hospital in Santo Domingo. Since 2001, this foundation in Springfield, IL has provided seven containers of high quality hospital equipment and supplies to AHD’s two hospitals. The IDB helped finance Hesburgh Hospital and provided a grant for technical cooperation and research in Santo Domingo. The Medical College sends 3-6 medical students to Ecuador to complete a month-long elective at one of AHD’s hospitals. RMHC has provided AHD with funding to develop its residency program in Santo Domingo and helped build the simulation lab on HH’s campus. Earlier funds helped bring high quality services to mothers and families, and in turn helped bring Hospital PVM to financial breakeven. Trimedx provides medical equipment repair and support by sending bilingual volunteer biomedical technicians to Hesburgh Hospital annually. Master’s in Global Health students from Eck conduct research on antibiotic resistance patterns in the communities where AHD works. The Institute donated a microbiology lab, which is housed on Hesburgh Hospital’s campus. Two Notre Dame undergraduates conduct a summer service learning experience with AHD each summer. A Ph.D. candidate from UW is studying mosquitos in Pedro Vicente Maldonado to assess the community’s prevalence of arboviruses, such as zika, dengue, and chikungunya. The university also sends 3-6 medical students to Ecuador to complete a month-long elective at one of AHD’s hospitals. Support from individuals like you has been AHD’s number one source of financing. Thank you! Staffed and Sustained by Ecuadorians. AHD will be one of two recipients of any profits from the new documentary Hesburgh. Fr. Hesburgh would be very proud of where Andean Health is today. He was co-founder of Andean Health and its Board Chair for 17 years. Opening weekend is April 26 in Chicago and South Bend, and May 3 in Milwaukee and other cities. 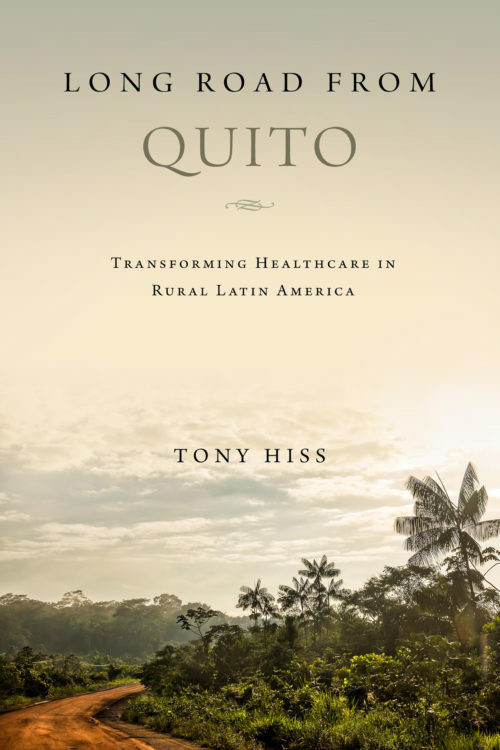 A book about the inspiring journey of Dr. David Gaus and Andean Health & Development is now on bookshelves. Long Road from Quito is written by Tony Hiss. A book signing by David Gaus will take place at Hammes Bookstore on the University of Notre Dame’s campus on June 1 at 11:30am.